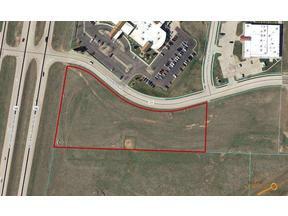 This 3.76 acres is located in one of the fastest growing areas in Rapid City. Highway frontage! Great Views! Located right next to Black Hills Orthopedic and Spine, LifeScape, Rapid City Ob/Gyn, Black Hills Dermatology & Laser Surgery Centre, Holiday Inn Hotel, Holiday Gas Station, Black Hills Energy and Regional Health Orthopedic & Specialty Hospital. Do not overlook this, compare price! Easy to Develop. City sewer and water at site. Seller will consider sub-dividing the lot.